There are millions of inspiring women working to lead the world and each other to be a better place for all of humanity. They bring a unique perspective to top issues facing each of us, male or female, every day. 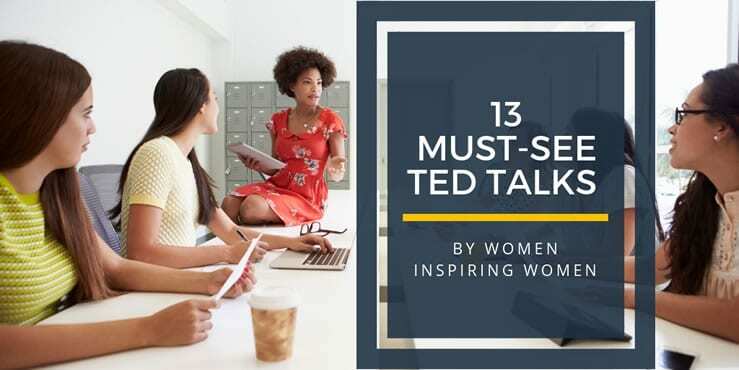 In this article, we’ve gathered some of the best TED talks by women on a diversity of topics from leadership to careers to feminism. Ranging from 8 to 20 minutes, they are sure to make you think and inspire you. Sheryl Sandberg addresses the three key issues keeping women from reaching the top that often lead them to drop out of the workforce or not reach their ultimate goals and provides advice for addressing them. What happens when you say yes to everything that scares you? It undoes the fear, at least it did for Shonda Rimes. Saying yes lead her to find the “hum” of her work that drives her to keep moving forward. And then it stopped. She discusses how she dealt with that reality and found her way to a different kind of hum. Dame Stephanie Shirley talks about how she went about starting an all-woman, work from home, a software company in the 1960s and the challenges she faced being a woman doing so at that time. She also discusses her motivators, lessons learned and provides advice for those looking to build their own company. An inspiring talk on what it really means to be a leader. Linda Cliatt-Wayman’s talks about the three principles that helped her turn around three schools and how love and active listening can truly change things. A truly inspiring talk for all leaders. Anne-Marie Slaughter discusses how to achieve equality – pointing to a need to look at equality for both men and women and coming to value breadwinning and caregiving equally. She proposed three areas that need to be addressed in order to accomplish our goals for equality. Regina Hartley talks about the concept of post-traumatic growth and why we need to give “Scrappers” and “Silver Spoons” an equal chance in hiring decisions. Often these people bring to the table the secret weapons of passion and purpose. A great talk for those responsible for making hiring decisions and responsible for ensuring diversity and inclusion. Susan Colantuono talks about how women can make their way from middle management to top-level positions. She delivers a key piece of advice about the element that women are often missing that is stopping them from moving up that most conventional advice to women skips. She also provides actions businesses can take to address this issue. Roselinde Torres speaks to what really makes a great leader today. Her talk covers the findings of her international research and the three questions that reveal who will be great and who won’t. Are you communicating a clear value definition? Casey Brown speaks to the idea of how you’re paid for the value you communicate. She also talks about how being willing to communicate our price is about focusing on the client and finding your voice. Brené Brown set out to measure shame and vulnerability and gained insights that changed her direction. In her quest to better understand humanity she learned about the power of vulnerability and the struggle with numbing we face. A talk to share. Amy Cuddy discusses her research on can you fake it until you become it when it comes to displaying confident, powerful body language? She explores the role hormones play in power and if short-term power posing exercises can have an impact on success. This talk is an exploration of the issues facing modern feminism through the eyes of 30-year-old blogger Courtney E. Martin. She speaks to the paradoxes her generation faces and how they’re redefining feminism for modern times. Find more wonderful TED talks inspiring women at https://www.ted.com/topics/women . Judd Brost - content marketing intern at QAT Global for Winter 2017-2018. Responsible for developing content for clients on solutions and technology issues, providing sales support, and assisting with the company's overall marketing activities.